von Gert Redlich im Juli 2017 überarbeitet - Nach dem Lesen mehrerer amerikanischer Tonband-Bücher war ich leicht verwirrt, ob denn nun wirklich alle Amerikaner erzählt (oder gelehrt) bekommen, AMPEX hätte 1947 das Tonbandgerät erfunden und SIKORSKY hätte den Hubschrauber erfunden. Auch war mir nicht klar, daß Europa eine kleine "offshore Insel" vor Neupfundland sei. Zum Glück gab es aber den redlichen Jack Mullin und noch weitere Amerikaner, die das Ganze vom Patriotismus losgelöst ganz real und weitgehend der Wahrheit entsprechend niedergschrieben und auch so publiziert hatten. 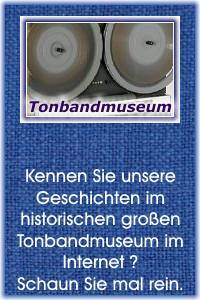 Parallel zu diesen englischen historischen Ausführen aus den USA gibt es hier auf unseren Magnetbandseiten "die große Magnetband-Story" auf Deutsch - aufgeteilt in die Zeit vor 1900 und in die Zeit ab 1900. Beide Artikel sind ausführlich bebildert mit vielen Links und sehr sehr lang. Bringen Sie etwas Zeit mit - es gibt viel zu lesen. by Steven Schoenherr, University of San Diego, - presented at IEEE Magnetics Society Seminar, UCSD, Nov. 5, 2002. Anmerkung : Steven Schoenherr hat sehr sauber recherchiert und er hat die wichtigen Namen alle korrekt zugeordnet und referenziert. Das ist für viele Amerikaner NICHT normal. Bei vielen Historikern wurde bereits in der Schule der Lokalpatriotismus so sehr geplegt und gestärkt, daß das Magnettonbandgerät viel zu oft von Ampex erfunden wurde. Hier ist das erfreulich wertneutral chronologisch richtig zusammengestellt. The history of magnetic recording began with the telegraph. When Samuel F. B. Morse sent an electrical signal for "What hath God wrought!" over a wire from Washington to Baltimore in 1844, he created a new technology and industry. Over the years, inventors sought to improve the telegraph. Alexander Graham Bell at the 1876 World's Fair in Philadelphia unveiled to the public a device that for the first time turned mechanical sound waves into electrical current and back again. He spoke into a microphone and his voice came out from a vibrating diaphragm speaker. The telephone was an instant success, won a prize at the Fair, launched what would become the world's largest communication company, and influenced countless others to improve the technology of sound recording. Valdemar Poulsen in Denmark would succeed in 1898 where Smith had failed. He built and patented the first working magnetic recorder called the Telegraphone Poulsen had become a telephone engineer at the Copenhagen Telephone Company in 1893 and began to experiment with magnetism to record telephone messages. By 1899 he filed U.S. patent 661,619 for a vertical wire-covered cylinder, and in 1900 demonstrated improved drum and horizontal wire cylinder models at the 1900 Paris Exhibition. While making these improved models, Poulsen and his partner Peder O. Pedersen discovered the application of a direct current to the recording head, called dc bias, and improved the sound quality on a steel tape version of the Telegraphone. At the Paris fair, Poulsen recorded the voice of Emperor Franz Joseph, today preserved in the Danish Museum of Science and Technology as the oldest magnetic sound recording. The U. S. Navy discovered a new use for the Telegraphone in World War I. In 1914 Germany used modified wire recorders purchased from the American Telegraphone Company to transmit highspeed wireless telegraph messages to German submarines in the Atlantic. Only another Telegraphone operating at high speed could record the messages and make them intelligible at a slower speed. Charles Apgar, an employee of the American Marconi Company, was operating an amateur radio station W2MN and had developed an amplifier using a DeForest Audion tube. He picked up the German radio transmissions, amplified them through a loudspeaker and recorded them on Dictaphone cylinders and gave them to the government. Secretary of the Navy Josephus Daniels ordered the Navy to close/seize the German radio station in Sayville NY on July 8, 1915, to stop the use of its Telegraphones by German spies. The Naval Research Laboratory in Washington began research on magnetic recording with 4 Telegraphones purchased from the American Telegraphone Company. Magnetic recording was improved in Germany after World War I. Kurt Stille had bought a Telegraphone in 1903 for his experiments, and by 1924 began sales of an improved wire recorder with an electronic amplifier to be used as a dictation machine. The German engineer ?? Fritz Pfleumer (er war erstens ein Österreicher in Dresden und er war mehr ein Verkäufer als der "Ingenieur" - die etwas lasche Definition eines "Ingenieurs" im Kaiserlichen Östereich war für uns Deutsche schon sehr befremdlich) discovered a different method of magnetic recording. While relaxing in a Paris caffe on a business trip in 1927 for the Universelle Company, that made cigarette machines, he thought of coating paper tape with iron oxide in the same way that he had been coating cigarette paper with bronze powder lacquer. (He built a samle recorder !!) His German patent for "sounding paper" was granted Jan. 1, 1928, but his tape recorder tore up the paper tape and was only used to demonstrate the potential of tape for editing and reuse. Hermann Bücher, Chairman of the Board of Directors of AEG took a personal interest in this potential and signed a contract with Pfleumer Nov. 28, 1932, to develop a recorder. Theo Volk led the AEG team that worked with Pfleumer and with another team led by chemist Friedrich Matthias of BASF, a subsidiary of the I. G. Farben chemical giant. AEG had expertise in producing high-frequency coils filled with carbonyl iron powder supplied by BASF, and I.G. Farben also produced films and plastics and a variety of coated materials. The partnership created by Bücher and Pfleumer because both were music lovers, would become one of the greatest corporate research and development triumphs of the century. Over the next three years, the teams perfected a tape and recorder that became the standard design for the industry for the next 30 years. Eduard Schuller patented in 1933 the ring-shaped magnetic head that was one of the team's most important inventions. Previous heads were shaped like phonograph needles or chisel and damaged the soft tape. Schuller's ring focused a strong magnetic field on a small area of tape without touching the surface. Matthias developed a two-layer magnetic tape, bonding a top layer of carbonyl iron powder with a base layer of cellulose acetate, similar to the kind of layered safety film made by Agfa for photography. Measuring and testing devices were invented to evaluate the performance of the recorders built by AEG. The Magnetophone appeared at a time in the 1930s when other kinds of magnetic recorders were being developed in Britain, the United States, and Japan. Ludwig Blattner had bought the rights to a steel tape device from Kurt Stille in 1929 that became the Blattnerphone. The BBC needed a recorder for its shortwave radio Empire Service that could broadcast the same program at different times throughout the British Empire, and improved the dc motor of the Blattnerphone with a synchronous ac motor and reduced the steel tape width to 3mm. The BBC would use these improved steel tape recorders from 1932 to 1936. The Marconi Wireless Company also improved the Blattnerphone for sale to radio stations in Canada, Australia, France, Poland, and Egypt. In 1935, the BBC and Marconi and Stille Inventions Ltd. joined to develop an improved Marconi-Stille recorder with a signal-to-noise ration of 45dB. However, the steel tape was persistent problem. It took two people to mount the 2700-meter reels that weighed 35 kg, and the brittle tape broke so frequently that the Marconi-Stille recorders came with a built-in spot welder. In the United States, Clarence Hickman at Bell Labs developed a steel tape telephone recorder but Bell did not market the machine outside the company. Semi Begun developed the Soundmirror steel tape recorder in early 1939 at the Brush Development Company in Cleveland, Ohio, that would be used by the military. Marvin Camras invented an improved recording head for wire in 1939 at the Armour Research Foundation in Chicago, and added his rediscovery of ac bias in 1940 for the Model 50 commercial wire recorder introduced in 1940. The German Magnetophone had advantages over all other magnetic recorders. It was portable (the "K" stood for "Koffer" (or portable case) in the K1 model of 1935) and was self-contained with its own amplifier and speaker. It was cheaper and more reliable than the steel wire and other tape machines. It was financed and manufactured by large and powerful corporations in Germany. The Germany military adopted a field version called the Tonschreiber, or "sound writer," and AEG made a very small spring-driven model C and a model D for war correspondents and a model F dictation machine. The models made for the German Navy were the RE-3 and the R-26. BASF developed a factory to mass-produce the reels of acetate tape, replacing the carbonyl iron coating (light gray in color) with magnetite (black). BASF tested the new tape by recording a concert by Thomas Beecham and the London Philharmonic Orchestra Nov. 19, 1939, (sorry, das war bereits 1936 !!!! im Feierabendhaus) at the factory in Ludwigshafen. But the quality of the tape recording that still used dc bias was not good. BASF improved the tape in 1939 with a new formulation of gamma ferric oxide (reddish-brown). The German broadcasting group RRG (Reichs Rundfunk Gesellschaft) joined the AEG-BASF partnership and worked to improve its quality. RRG engineer Walter Weber rediscovered ac biasing in April 1940 and the Magnetophone demonstrated to more than 2000 journalists in Berlin June 10, 1941, produced a 60dB dynamic range and the 50-15,000 kHz frequency response. The model K7 in 1943 had synchronous motors to reduce wow and flutter and could even record in stereo. The tape speed of 30 ips (77 cms) became the standard for future speeds of 15, 7.5, 3.75 and 1.875 ips. Major John T. Mullin brought the German Magnetophone to America at the end of the war. He was an electrical engineer in the Signal Corps assigned to investigate radar interference in Britain. As he listened to many hours of music broadcast from Germany each night, he wondered how full orchestras could be playing symphonies uniterruptedly at all hours of the night. The quality (Anmerkung : aber AM = Mittelwelle !!) was equal to live radio, and was better than shellac records. On a trip to Radio Frankfurt he discovered the secret: Modern modified Magnetophones with ac biasing. He studied the circuitry of these machines, and sent 2 old machines with dc biasing home to San Francisco with 50 reels of BASF Type L tape. Anmerkung : Jack Mullin erzählte später, daß er dort in Bad Nauheim Fotos der HF-Röhren-Schaltpläne gemacht hatte, sodaß er überhaupt die beiden älteren K4 später auf die HF-Vormagnetisierung umbauen konnte. He modified the electronics of the old machines to add dc biasing (sorry, hier ist AC-biasing richtig) and demonstrated them May 16, 1946, to the Institute of Radio Engineers in San Francisco. Harold Lindsay heard this demonstration and told Mullin about the Ampex Corporation, that had been founded by Alexander Matthew Poniatoff in 1944 (the name came from his initials plus "ex" to avoid using the same name AMP already taken by the Aircraft Marine Products company). Ampex Electrical and Manufacturing Company built high quality motors and generators that used Alnico 5 magnets from the GE, but with the war ended Poniatoff was looking for a new product. Bing Crosby opened the floodgates for magnetic tape recording in the broadcast industry. Despite the network prohibition of recordings, during the war years some radio stations had started using Brush and Armour wire recorders for broadcasting news events and for west coast delayed time. The new ABC network allowed Bing Crosby to record his "Philco Radio Time" show in the fall of 1946 on transcription discs but these were difficult to edit. Crosby's technical producer Murdo McKenzie learned about Mullin's Magnetophone, now called the "Magnetrack for a motion picture film recording business" he started with W. A. Palmer in Hollywood. In August 1947 McKenzie arranged three different recordings of Crosby's first Philco show of the 1947-48 season: by Jack Mullin, Colonel Ranger, and the standard transcription disc. Anmerkung : Entgegen eigener historischer Aussagen von Ampex "Freunden" hatte Ampex zu dieser Zeit noch keine funktionierende Magnetband-Maschine verfügbar. Ampex was not alone. During World War II, Semi Begun at the Brush company developed a ring-type recording head under contract with the Office of Scientific Research and Development. This ring worked best with coated tape and with Gerard Foley of the Batelle Memorial Institute developed paper and acetate tapes coated with alnico and magnetite powders. Brush approached a number of companies, including the Minnesota Mining and Manufacturing company, to manufacture the tape. In 1944, Ralph Oace at 3M solved the problem of coating a paper base with the magnetite powder, but the war ended the funding for the project. The Shellmar company manufactured the paper magnetite tape in 1946 for the Brush Soundmirror tape recorder and also a 5-inch magnetic disk for the Brush Mail-A-Voice disk recorder that sold for only $40. The experiments of Oace and the FIAT reports of the German BASF tapes caused the 3M company to create a magnetic tape laboratory in 1946. This 3M lab discovered that needle-shaped acicular particles of gamma ferric oxide produced better coercivity (350 oersteds) than the cube-shaped particles of magnetite used by Brush (150 oersteds). 3M introduced the Type 100 paper tape (black oxide) in 1947, and the popular Type 111 acetate tape (red oxide) in 1948 that Bing Crosby used to record his Philco show with the new Ampex 200 tape recorders. The motion picture industry was quick to adopt the tape recorder for its ability to edit sounds during production, and for the improved quality of sound during exhibition. This is "Cinerama" premiered Sept. 30, 1952, at the Broadway Theater in New York and would play for 122 weeks. This 3-projector system designed by Fred Waller used a wide curved screen and a separate 7-track magnetic soundtrack designed by Hazard E. Reeves for specially equipped theaters. The Robe premiered Sept. 16, 1953, at the Roxy in New York in "Cinemascope" by Twentieth Century Fox with 4-track magnetic soundtrack on the edge of each 35mm cellulose triacetate filmstrip. The emerging computer industry saw magnetic recording as a solution to the problems of data storage and speed. In 1937, Victor Atanasoff considered a variation of Poulsen's magnetic drum as a possible memory device for his early ABC electronic computer. However, he could not afford the vacuum tubes necessary to amplify the magnetic pulses, and decided to use non-magnetic capacitors on the drum. In 1947, William C. Morris led a group of engineers at Engineering Research Associates (ERA) in Minneapolis that had worked on Project Goldberg for the Navy to develop a computer that could solve cryptographic problems. They built the first magnetic drum out of recording tape from a captured German Magnetophone recorder and heads from a Brush wire recorder. The strips of tape would not stick to the aluminum drum, so they spray-painted an iron oxide emulsion obtained from 3M in Minneapolis directly onto the surface of the drum. John Coombs reported their success at the Chicago National Electronics Conference in November 1947. The drum was 5 inches in diameter and revolved at 3000 rpm, recording at a density of 230 bits per inch with a rigid head mounted only .001 inch from the surface of the drum. Howard Aiken at Harvard was also experimenting with a magnetic drum on the Mark II computer in 1947, and he would make the drum the key feature of his improved Mark III computer in 1948. Harry Huskey would use a magnetic drum in this design of the Standards Eastern Automatic Computer for the National Bureau of Standards in 1948. Arnold D. Booth in Britain built a magnetic drum for the Automatic Relay Computer in 1948 and would install a drum in the Manchester "baby" computer in 1949. The magnetic drum was fast but did not have the large capacity needed for data storage. John W. Mauchly and J. Presper Eckert began work in 1943 on ENIAC at the University of Pennsylvania for the U.S. Army. It was not finished during the war but in 1946 they started the Electronic Control Co. and received grant from National Bureau of Standards to build a ENIAC-type computer with magnetic tape input/output, renamed UNIVAC in 1947, but the project ran out of money. The two scientists formed Eckert-Mauchly Computer Corporation (EMCC) in Dec. 1947 and developed by 1949 the BINAC stored-program computer for Northrop Aircraft, with mercury delay line memory and a primitive magnetic tape drive. Remington Rand bought EMCC in Feb. 1950 and provided funds to finish UNIVAC March 30, 1951. It announced on June 14, 1951, the sale of UNIVAC I to the Census Bureau. It was the first commercial computer to feature a magnetic tape storage system that consisted of eight UNISERVO tape drives standing separate from the CPU and control console on the other side of a garage-size room. Each tape drive was six feet high and three feet wide, used 1/2-inch metal tape of nickel-plated bronze 1200 feet long, recorded data on eight channels at 100 inches per second with a transfer rate of 7,200 characters per second. The complete UNIVAC system weighed 29,000 pounds, included 5.200 vacuum tubes, and an offline typewriter-printer UNIPRINTER with an attached metal tape drive. Later, a punched card-to-tape machine was added to read IBM 80-column and Remington Rand 90-column cards. The UNIVAC I was used in November 1952 to calculate the presidential election returns and successfully predict the winner, although it was not trusted by the TV networks who refused to use the prediction. Magnetic tape systems became the standard data storage system in the 1950s. At IBM in 1952, Arthur J. Critchlow began the Source Recording project at the new IBM research lab in San Jose, California, under the direction of Reynold B. Johnson. The purpose was to find a better method than punched cards or drums or tape to store and access information. They read an article by Jacob Rabinow at the National Bureau of Standards in the August 1952 issue of Electrical Engineering about "The Notched-Disk Memory" that stored magnetic pulses on thin metal disks mounted vertically in a doughnut-shaped ring. Each disk had a notch to align magnetic read/write heads. Critchlow adopted this magnetic disk idea in February 1953 and Johnson began work at San Jose on a 50-disk system with the capacity of 50.000 punched cards, or 4 million characters. In April 1953, William A. Goddard headed a team of 4 engineers to develop the disk device. In May, he adopted the "air head" method of maintaining a uniform head-surface gap of .002 inch using a forced air cushion. In June 1953 a successful test was completed with the airhead reading a writing digital data on the surface of a 16-inch aluminum disk sprayed with iron oxide paint. By October 1953, spray paint was replaced by spin coating, and a servo-controlled cable-and-pulley carriage was used to successfully locate random tracks on the spinning disk. In February 1954, data was being transferred to and from a card reader. During 1954 a Model II was designed and built with a 50-disk array mounted on a vertical shaft. This model was given its first public demonstration in May 1955 as the Random Access Memory Accounting Machine, or RAMAC. An improved Model II was demonstrated at the February 1956 Western Joint Computer Conference. Each disk was 24 inches in diameter and 0.1 inch thick and separated from other disks by 0.3-inch spacers. The disks revolved at 1.200 rpm and were accessed by a single read/write head that moved up and down the stack of platters Each disk had 100 circular tracks with a density of 500 characters per track, recorded by IBM's NRZI variable density method of 100 bits per inch on the inner track and 55 bits per inch on the outer track. This was the equivalent of storing 5 MB on a magnetic drum 13 inches diameter and 42 feet long. The disk array became the IBM 350 Disk Storage, and deliveries to customers began in June 1956 for a monthly lease of $750. The computer and the transistor in the 1950s joined with the automobile and the teenager to create a new generation of stereo "Hi-Fi" components. Magnetic tape and FM radio made possible a new quality of sound. The tape recorder industry quickly expanded in Europe and Asia after the war. In Britain, EMI used the German design to produce the BTR1 for its Abbey Road studio in November 1947. The Grundig Company in Germany was started by radio dealer Max Grundig after World War II to produce radio repair instruments. It expanded into radio set production, making the Heinzelmann in 1946 and the Grundig Boy in 1949 that was one of the first portable cabinet radios. Grundig took over the Lumophon factory in Nuremberg and in 1951 began production of its first tape recorder, the Reporter 300. Willi Studer in Zurich produced his first recorder, the Dynavox, in 1949 and the Studer 27 in 1951 and the Revox A77 in 1967. Stefan Kudelski, a physics student in Switzerland, built the Nagra I portable tape recorder with wind-up motor in 1951 used by the Everest explorer Raymond Lambert and by the deep-sea bathyscaph Trieste. The videotape recorder would become one of Sony's greatest successes, but it began as another example of the influence of Bing Crosby. John Mullin at Bing Crosby Enterprises demonstrated an experimental 12-head VTR at 100 ips in 1951. The Ampex team led by Charles Ginsburg began work on VTR in October 1951. Ray Dolby, 19, dropped out of school to join the project and helped the team demonstrate the first system Nov. 19, 1952, but with a poor picture. A second system in March 1953 used 4 heads rather than 3 but problems continued with "venetian blinds" effect due to discontinuous recording (sorry - means switching and syncronizing) from one head to the next. By 1954, the Ampex team included with Charles E. Anderson, Shelby Henderson, Fred Pfost, and Alex Maxey. By Feb. 1955 Anderson designed an FM circuit; Ray Dolby rejoined the team after his stint in the Army and designed a multivibrator modulator by Feb. 25 1955; Alex Maxey discovered how to vary tape tension and Pfost developed a new sandwich-type magnetic head. The improved model of the taperecorder was shown in Feb. 1956 to Bill Lodge of CBS and other TV people in preparation for the first public demonstration in April. The Mark IV went on public display April 16, 1956, at the Chicago convention of the National Association of Radio and Television Broadcasters, the same day that Ray Dolby demonstrated the older Mark III in Redwood City. The Mark IV, later renamed the VRX-1000, used 2-inch wide 3M tape at 15 ips over rotating head assembly recording at a slant on tape surface with AM sound. During the next 4 weeks, Ampex took orders worth $4.5 million, and took out a trademark on the name "videotape" for its recorder. Color was not the only new development in 1959. Toshiba in September demonstrated prototype helical scan model VTR-1, with 2-inch tape running at 15 ips over just one head. After the demonstration, Sony began to develop the helical scan VTR. Sony persuaded Ampex to share its VTR patents and Sony shared transistorized circuitry with Ampex. In 1961, JVC (founded as the American-owned Victor Co. of Japan in 1946, but owned by Matsushita since 1953) demonstrated helical scan color VTR with 2 heads to compete with Sony's PV 100, that was adopted by American Airlines in 1964 for in-flight movies. Helical scan technology held great promise for its potential to reduce the size of tape machines and permit slow motion and stop action effects, but not for another decade. The answer to all these problems came from Holland. In 1965, (sorry, it was August 1963 !!) the Philips company introduced the "compact cassette" for consumer audio recording and playback on small portable machines such as the Norelco Carry-Corder 150. Philips intended the cassette to be used for business dictation, and had no idea that it would appeal more to consumers who wanted a simple method to record music. The cassette used 1/8-in. tape with 4-tracks running at 1-7/8 ips, allowing 30 or 45 minutes of stereo music per side, and most importantly, was only 1/4 the size of other cassette systems. The cassette format became the basis of the videotape revolution in the 1970's. Sony introduced the 3/4-inch U-matic VCR in the U.S. in 1971, and for the first time, allowed other manufacturers to sell machines that could play the cassette, and thus succeeded in establishing a world standard for the 3/4-inch videocassette. In 1975 Sony introduced in the U.S. the Betamax consumer VCR console for $2.295 with one-hour 1/2-inch tape cassettes for $15.95. Sony sought to create a standardized format, as it had done with the U-matic, by getting other companies to produce machines that would play the Beta cassettes, but refused to license the cassettes themselves. The next year JVC introduced the VHS format and a VCR for only $885 and licensed the technology to other companies (almost free). The transformation of the credit card created a multibillion-dollar industry. IBM had perfected in the 1960s a method of adhering a magnetic stripe to the surface of a plastic credit card. This stripe could have multiple tracks and allow read and write operations from special machines capable of decoding binary data. American Airlines and American Express first used striped cards for ticketing at O'Hare Airport in Chicago. The first of three tracks on early credit cards was used by the airline industry. The second track contained identifying information such as account numbers and names. The third track was read-write and could hold the balance of an account. One of the most significant developments of the 1970s was the floppy disk. The engineers at IBM who had developed RAMAC and the early disk drives understood their significance. In late 1967, a group known as "Dirty Dozen" left the IBM research lab in San Jose to found Information Storage Systems (ISS) that sold disk drives through Telex. They were followed during next three years by over 200 other engineers who would leave IBM for the new disk drive companies like Memorex and Shugart Associates. After the departure of the Dirty Dozen, IBM assigned David I. Noble the job of designing a cheap and simple device to load operating code into large computers. Called the Initial Control Program Load, it was supposed to cost only $5 and have a capacity of 256 KB. During 1968 Noble experimented with tape cartridges, RCA 45rpm records, dictating belts, a magnetic disk with grooves developed by Telefunken, but finally created his own solution - the floppy disk. Called the "Minnow," it was a plastic disk 8 inches in diameter, 1.5mm thick, coated on one side with iron oxide, attached to a foam pad and designed to rotate on a turntable driven by an idler wheel. A read-only magnetic head was moved over the disk by solenoids and read data from tracks prerecorded on the disk at a density of 1100 bits per inch. The disk was "hard-sectored" with 8 holes around the center to mark the beginning of data sectors. At first, its capacity was only 81.6 KB, but by Feb. 1969 he had doubled the thickness of the plastic base to 3mm and coated both sides to add more capacity. In June 1969, the Minnow was added to the IBM System 370 and soon began to be used by other divisions in IBM. In 1970, the name was changed to Igar and Noble had a staff of 25 engineers to help him make improvements. By 1971, Igar became the 33FD disk drive and the 8-inch floppy disk became the Type 1 diskette. The speed was 360 rpm, with head access time of 50 milliseconds. The floppy disk emerged from IBM at the same time the microprocessor emerged from Intel. When the first Altair and Imsai microcomputers came on the market in 1974 using the 8080 processor, there were no peripherals available to store data or even display words on a CRT screen. The only input/output device was a Teletype (die Tastatur einer Schreibmaschine). There wasn't even an operating system for these new computers. In 1975, Alan Shugart produced an 8-inch floppy disk to hold 800k that offered for the first time a low-cost drive for the emerging personal computer market. In 1976, Jim Adkisson, a Shugart engineer, sat down for lunch with a customer who complained that the 8-inch drive was too big for the personal computer. When Adkisson asked what the size should be, the customer pointed to a napkin (eine Serviette) on the table and said, "About that size." Adkisson returned to the Shugart lab with the napkin and designed the 5.25-inch floppy drive, introduced in 1976 as the model SA400 with a capacity of 110 KB. The model became one of Shugart's best sellers, with shipments the rose to 4000 drives per day. The company turned to Matsushita in Japan to help make the drives, starting that company on its rise to becoming the largest floppy drive manufacturer in the world. Sony developed a 3.5-inch floppy drive by 1980 and began a two-year effort to make it the U.S. floppy disk standard. Sony declared that its new drive was smaller, faster, better protected, and could fit in a shirt pocket. A group of U. S. disk manufacturers opposed the new standard. The group was led by Shugart Associates and Control Data, and included Verbatim, Micro Peripherals, Dysan and Tabor. They sought to keep the standard 8-inch and 5.25-inch disks made by U.S. companies since IBM introduced the floppy disk in 1971. The Digital revolution of the 1980s continued the use of the cassette and disk and magnetic tape. In 1986 Sony and competitor Philips introduced a "Digital Audio Tape", or DAT, as a result of efforts of the 81-member firm R-DAT consortium to develop a recordable version of the optical compact disc. Because of copyright problems, electronics firms delayed development of consumer products and DAT remained a high-priced professional medium. In 1991 the Alesis Corporation of Los Angeles introduced its new ADAT machine that recorded 8 tracks of digital audio to a standard S-VHS videocassette using the same helical scan technology that created the videocassette boom in the 1970s. With a list price of $3.995, and cassettes at $15, the ADAT made multitrack digital recording affordable for the small studio, with the ability to connect together up to 16 ADATs for a total of 128 synchronized tracks. 20.000 were sold in its first year from October 1992 to November 1993 and 80.000 sold by 1998. The Electronic Musician declared in Oct. 1992 that "ADAT is more than a technological innovation; it's a social force." In 1992 Sony began sales of the MiniDisc that had been announced May 30, 1991. The MD was a recordable magneto-optical disc encased in a plastic cartridge with the same 74-minute capacity as the CD but at half the size and with greater compression. The MD was intended to replace the CD and the compact cassette. Sales of cassette tapes began to decline in 1989, and Sony felt that the compact cassette system was nearing the end. Der Vortragende hatte aus unbekannten Gründen die PCM Technik von 1976 nicht mit erwähnt. Bei den PCM Recordern wurde das analoge Signal imPCM Prozessor in digitale Daten gewandelt und in den Informationsfenster jeweils eines einzelnen Fernsehbildes sequentiell gespeichert. Also auf einem analogen Videorecorder konnte man bis zu 4 Stunden Edel-Hifi in Stereo abspeichern - mit diversen Problemen - aber es ging. 1. On Morse and the telegraph see Lewis Coe (1993; on Bell and the telephone see Robert Bruce (1990). On Oberlin Smith see Mark Clark "The Magnetic Recording Industry" (1992) and his Chapter 2 of Magnetic Recording: the First 100 Years, edited by Daniel et. al. (1999). 2. On Poulsen see Begun's Chapter 1 (1949), and Mark Clark "The Magnetic Recording Industry" (1992) and his Chapter 3 of Magnetic Recording: the First 100 Years (1999). 3. On Sayville and the Navy, see Morton (1995) pp. 89-90. 4. On Stille and Begun see Begun's Chapter 1 (1949) and Mark Clark's Chapter 4 of Magnetic Recording: the First 100 Years (1999). 5. On Pfleumer see Friedrich Engel's Chapter 5 of Magnetic Recording: the First 100 Years (1999). 6. On steel tape in the 1930s, see Begun's Chapter 1 (1949), Morton Chapter 3 (1995). 7. On the German Magnetophone see Friedrich Engel's Chapter 5 of Magnetic Recording: the First 100 Years (1999) that used primary documents of BASF (now EMTEC). 8. On Mullin see Nmungwun's Chapter 4 (1989) that used primary documents of Ampex and interviews with Mullin; see also the Mullin videotape from the Audio Engineering Society. 9. On Crosby see Nmungwun's Chapter 4 (1989); the Mullin videotape (1989); Schoenherr "Der Bingle Technology" (2002); Ampex quote from Perry (1967). 10. On Begun see Begun's Chapter 1 (1949) ; Beverley Gooch's Chapter 6 of Magnetic Recording: the First 100 Years (1999); letter from Ralph J. Oace to Bert S. Groves, Jan. 31, 1964. 11. On motion picture sound see Belton (1992). 12. On the magnetic drum see Schoenherr "The Magnetic Drum" (2003). 13. On UNIVAC see Gray (2001); on SAGE see Spicer (2000) and Schoenherr "The SAGE Air Defense" (2000). 14. On RAMAC see Johnson (1989); Schoenherr "The Floppy Disk" (2003). 15. On tape recorders see Angus (1984); Grundig history (2002); Nagra history (2002); Sony history (2002); Studer history (2002). 16. On the VTR see Nmungwun's Chapter 6 (1989); Ginsburg (1957). 17. On helical scan, see Nmungwun's Chapter 7 (1989); Schoenherr "Television Instant Replay" (2002). 18. On the cassette see Morton's Chapter 8 "The Eight Track Tape Cartridge" in his "History of Magnetic Recording" (1995). 19. On the Walkman see David Frith (1999). 20. On Dee Hock and the credit card, see Mandell (1990). 21. On the floppy disk see Schoenherr "The Floppy Disk" (2003) . 22. On Shugart see Schoenherr "The Floppy Disk" (2003). 23. On the digital revolution, see Schoenherr "The Digital Revolution" (2001). Angus, Robert. "History of Magnetic Recording," Audio, September 1984, pp. 33-39. Begun, Semi Joseph. Magnetic Recording. New York: Rinehart, 1949. Belton, John. "1950s Magnetic Sound: The Frozen Revolution," in Rick Altman. Sound Theory/Sound Practice. NY: Routledge, 1992. Bruce, Robert V. Alexander Graham Bell and the Conquest of Solitude. Boston: Little, Brown, 1973. Clark, Mark H. "The Magnetic Recording Industry, 1878-1960: an international study in business and technological history." Ph. D. thesis, University of Delaware, 1992. Coe, Lewis. The Telegraph: A History of Morse's Invention and Its Predecessors in the United States. Jefferson, North Carolina: McFarland, 1993. Coe, Lewis. The Telephone and its Several Inventors: a History. Jefferson, N.C.: McFarland & Co., 1995. Daniel, Eric D., C. Denis Mee, Mark H. Clark, eds. Magnetic Recording: the First 100 Years. New York: IEEE Press, 1999. Frith, David. "Sony Walkman Personal Stereo Turns 20 Years Old; The Evolution of Portable Audio's Past, Present and Digital Future," PR Newswire , April 5, 1999. Ginsburg, Charles P. "The Birth of Videotape Recording." paper presented at SMPTE annual meeting Oct. 5, 1957. Gray, George. "The UNIVAC Solid State Computer." Unisys History Newsletter. Volume 1, Number 2, December 1992 (revised 1999). www.cc.gatech.edu/services/unisys-folklore/dec92-v1n2.html (1999). Gray, George. "UNIVAC I: The First Mass-Produced Computer." Unisys History Newsletter, Volume 5, Number 1, January 2001. www.cc.gatech.edu/gvu/people/randy.carpenter/folklore/v5n1.html (2001). Mandell, Lewis. The Credit Card Industry: A History. Boston: Twayne Publishers, 1990. Morton, David Lindsay, Jr. "The History of Magnetic Recording in the United States, 1888-1978," Ph.D. thesis, Georgia Institute of Technology, 1995. Mullin, John T. "An Afternoon with John T. Mullin." videotape, New York: Audio Engineering Society, 1989. Nmungwun, Aaron. Video Recording Technology. Hillsdale, New Jersey: L. Erlbaum Associates, 1989. Perry, Gregg. "Twenty Years of Magnetic Recording." Ampex press release, Oct. 1, 1967. Schoenherr, Steven. "Der Bingle Technology." ready.to.wear, May 1, 1996, revised for Recording Technology History. derbingle.html (2002). Schoenherr, Steven. "The Floppy Disk" in John L. Heilbron, ed., The Oxford Companion to the History of Modern Science. New York: Oxford University Press, 2003. Schoenherr, Steven. "The Magnetic Drum" in John L. Heilbron, ed., The Oxford Companion to the History of Modern Science. New York: Oxford University Press, 2003. Spicer, Dag. "Dr. Strangelove Meets IBM: The SAGE System." Dr. Dobbs History of Computing #1. ftp.ddj.com/articles/2000/0085/0085a/0085a.htm (2000). Das sind die original Links aus dem Abdruck des Vortrags von Nov. 2002 "History of Magnetic Recording"
Die Mehrzahl der obigen Links stimmt entweder überhaupt nicht mehr bzw. dort wird Maketig-Schmalz ausgewrungen oder es steht schlicht und ergreifend die Legende als mediale Wunschvorstellung drinnen. Auf www.fernsehmsueum.info und www.hifimuseum.de stehen die Hintergrund-Informationen zu den Firmen- und Persoonen- Storys und Geschichten - aber alles möglichst wertneutral und dennoch kritisch aufgearbeitet.